Now I love MUFE's Eye Seal. I love it I do, but, it makes your brushes rock hard. In the last few weeks I've been using it with so many brushes to mix pigments to make liners or eyeshadows, and as a result my brushes turned into rock hard messes. Now I have heard of this happening from another beauty blogger. Last night I was washing some brushes and realized 5 of mine were rock hard. I didn't really know what to do. I tried makeup remover, nope. I tried mineral oil, nope. I tried brush cleaner, nope. 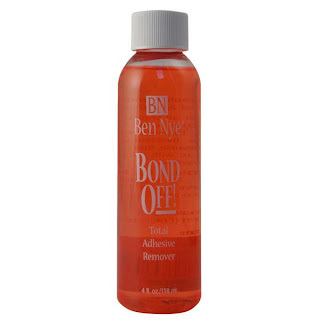 I tried Ben Nye Bond Off, yep. Wait a second, yep that worked! So how I did it without the bond off ruining the glue that holds the brush together. Put some Bond Off onto a paper towel. Wipe the brush back and forth a few times (no matter how hard it is) and wait for it to soften up. A few times should do the trick. Then wash as usual. Easy. So glad I figured it out and another use for Bond Off (since I never use it).